In the late 1800’s, following a violent incident on his family’s Estate in Alberta, Canada (during which several deaths occurred), young James Howlett fled to a mining camp in Northern British Columbia with a childhood friend. He took the name Logan, after the first victim of his newly discovered mutant powers, which included super-human strength and healing power, and large retractable claws. Over the course of his unnaturally long life, Logan grew up with the Blackfoot Indians, lived alone in the Canadian wilderness, fought in both World Wars, was recruited as an assassin by the CIA and finally was ‘volunteered’ for the Weapon X project in which his skeleton and natural bone claws were infused with the indestructible super alloy, ‘adamantium’. He was subsequently requited by Professor Charles Xavier and joined the Xmen. 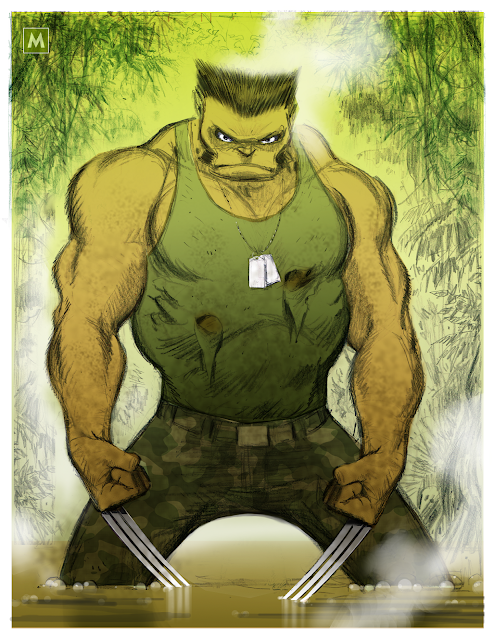 I have added Weapon X to my deviantART Gallery!